For decades, feminism has argued the case for getting women into the workplace. Affirmative action, support schemes, paid maternity leave…all valuable devices, and yet still we agonise over why women aren’t better represented in the boardrooms and ministries of this country. But the answer is so shriekingly obvious, and yet hardly anybody ever acknowledges it. It’s because for women, the opportunity to work at those elite levels usually means opting out of having a family. Either that, or working like a lunatic whilst being plagued by personal guilt on one hand and the covert critique of other mothers on the other. The greatest asset male executives, politicians and sportspeople have enjoyed throughout centuries of success is one that never appears on balance sheets or tax returns. And yet this asset keeps their lives turning over more efficiently than an accommodating accountant or the most obliging of personal assistants. And it is: The Wife. ‘Why can’t I have a wife?’ It’s a common joke among busy women. But it’s not a joke. Male politicians who reach their forties without having children are so rare as to be remarkable (think John Hewson’s comments on Bob Carr), but politics is full of women who are childless. Why? Because if you want to combine kids with an elite career, the first thing you need (if you’re going to have the best possible shot at it) is a stay-at-home spouse. And it’s awfully hard to interest a bloke in a gig like that. 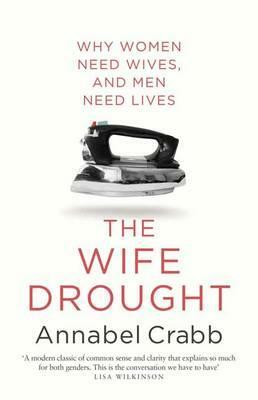 The Wife Drought is not a shout of rage, but it is asking us to sit up and listen. Sometimes as women we spend too much time thinking about flexibility from only one perspective - ours. But what about the men? Shouldn’t the fight for workplace flexibility extend to men as well? And then perhaps it wouldn’t be seen as such an anomaly to see a man in a part-time role so he can spend more time with the kids? Cliche but true: kids need their fathers too. This book is full of stories from the author’s work in and around politics and media, and involves anecdotes about high-profile women - and men. It will look at some research about flexibility in the workplace; it will look at statistics about childlessness and correlation to financial success for women and men. It will include some embarrassing disclosures about things Annabel Crabb has done to make life work in a busy career with three children. It will look at what happens to men who pitch in and take responsibility for their children. It will seek out some blokes who have made the decision to do more at home and it will love them up pretty concertedly. It will contain some advice about how to build your own artificial wife, using trained partners, child care, friends and family. This is a shout-out to men and women everywhere to take control.